. 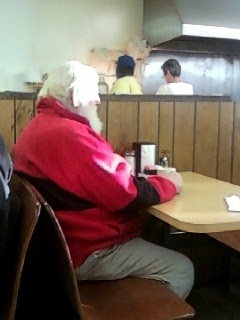 . . we spotted Santa eating breakfast at the Kwik Karry this morning. I hope you were able to give him a Gingerbread Cookie! Wow,santa at quik-carry--I wonder if he got in on the Christmas lights bus tour? wish i was able to take a pic... I SAW THE SAME SANTA on my way to wagener planting flowers! !